Bison forward Kamerin Nault in action during a weekend series against the Calgary Dinos on Nov. 24-25 at the Wayne Fleming Arena. Nault took a bit of an unconventional route to get to the University of Manitoba. He played B division high school hockey for the Garden City Gophers in his Grade 10 year after being cut from the Winnipeg AAA Hawks. The next season, he tried out again for the Hawks, only to be cut again. The Winnipeg AAA Monarchs offered him a spot, but Nault elected to stay with Garden City after learning they would move up to the A division his Grade 11 year. It all paid off when Nault was off playing for the Winnipeg Blues of the Manitoba Junior Hockey League in his final year of high school. During his two seasons with the Gophers, Nault played 43 games, scoring 31 goals and adding 30 assists for 61 points. Nault racked up 203 points (98 G, 105 A) in 208 career games with the Blues, averaging just under one point per game. In 2014, he and teammate Byron Spriggs won the MJHL Championship with the Blues, and in 2016 Nault was named an MJHL Second Team All Star. Nault played in 11 games last season for the Bisons, scoring only one goal. This season he’s blown those numbers out of the water. In 14 games so far this season, Nault has a team-best seven goals and five assists for 12 points. The Winnipeg native has found success centring a line of Michael St. Croix and Zach Franko, a line created when the Bisons were across the pond in Scotland and Ireland. After a forgettable rookie campaign statistically, Nault went back to his old habits in the off season. Of Nault’s seven goals this season, a few of them have come at key times. Nault scored a crucial goal to tie things up against the Saskatchewan Huskies on Oct. 20 en route to a Bison overtime win. On Nov. 11, Nault scored the game winner in the second overtime against the Regina Cougars. The next weekend he scored with four seconds left against Lethbridge to send the game to overtime, a game the Bisons eventually lost. “I’ve always liked being out there in the last minute of every game to try and help the team win so I think just given the opportunity I try to make the most of it,” Nault said. 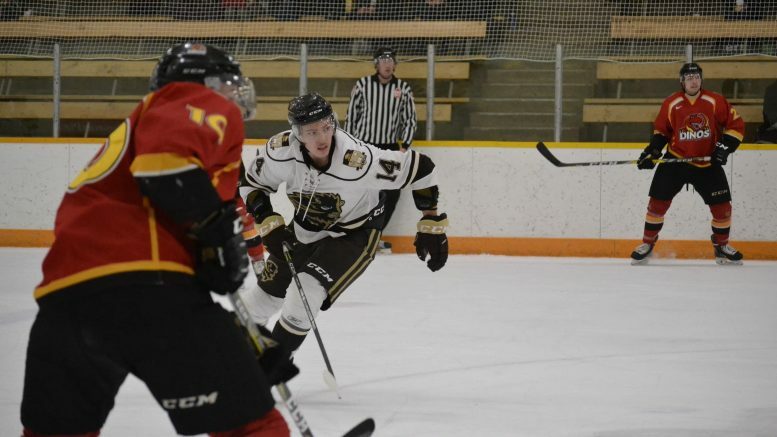 Manitoba’s tough schedule to start the season has helped the team according to Nault, as the Bisons were able to see where they stack up in the Canada West.